The Mom Crowd » What is Up with the Cough and Cold Medicine News? What is Up with the Cough and Cold Medicine News? On October 12th makers of cough and cold medicines pulled their drugs targeted for babies and toddlers from store shelves. Then the following Friday an advisory panel for the Food and Drug Administration voted to ban over-the-counter cold products targeted for children under six years old. The votes to ban the over-the-counter products for 2 years of age and younger was 21-1, while the vote to ban over-the-counter products for ages 2-5 years of age was 13-9. So we most likely won’t see a ban for drugs for children over the age of 2, because the agency is likely to ignore such a close vote according the New York Times. The ban is suggested, because all 11 studies reviewed by the panel report that the medicines don’t work and in some rare cases cause serious harm. Also, the drugs were only tested on adults and assumed to be safe in children. Researchers have since found that some medicines react differently in children than adults. Also a ban may not happen for a while, because of the red tape of the FDA and the manufacturers will fight the ban according to the New York Times. The panel’s patient and family representative, Amy Celento of Nutley, N.J. in an AP article said that she fears that parents will administer adult products to their children because they work for them or feel they work for them. In the same AP article, “the panel also recommended drug makers provide standardized droppers with their liquid cough and cold medicines. Experts had told the panel the sometimes hard-to-use dosing devices contribute to parents unwittingly overdosing their children.” I agree! It takes me about five tries to get the medicine in the dropper right at .4 or .8. Better droppers would be nice! There is a lot of talk in the media about these medicines and the FDA is taking no action right now. The advisory panel has only made suggestions to the FDA. If the reports claim that the medicines don’t work, then a ban is not a loss to parents. Although, I know one parent who claims the medicines work for her four children. My daughter is only five months old, so I wouldn’t consider cough and cold medicine. She had her first cold last week and I have given her some children’s Tylenol when she had a fever and on the nights she was extremely uncomfortable. I have also made sure to feed her often, so she gets lots of liquids to break up the mucus. We also used a warm humidifier a few nights. What should parents know about using cough and cold products in children? * Do not use cough and cold products in children under 2 years of age UNLESS given specific directions to do so by a healthcare provider. * Do not give children medicine that is packaged and made for adults. Use only products marked for use in babies, infants or children (sometimes called “pediatric” use). * Cough and cold medicines come in many different strengths. If you are unsure about the right product for your child, ask a healthcare provider. * If other medicines (over-the-counter or prescription) are being given to a child, the child’s healthcare provider should review and approve their combined use. * Read all of the information in the “Drug Facts” box on the package label so that you know the active ingredients and the warnings. * Follow the directions in the “Drug Facts” box. Do not give a child medicine more often or in greater amounts than is stated on the package. * Too much medicine may lead to serious and life-threatening side effects, particularly in children aged 2 years and younger. * For liquid products, parents should use the measuring device (dropper, dosing cup or dosing spoon) that is packaged with each different medicine formulation and that is marked to deliver the recommended dose. A kitchen teaspoon or tablespoon is not an appropriate measuring device for giving medicines to children. * If a measuring device is not included with the product, parents should purchase one at the pharmacy. 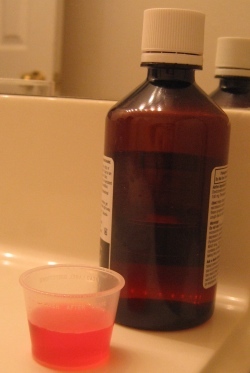 Make sure that the dropper, dosing cup or dosing spoon has markings on it that match the dosing that is in the directions in the “Drug Facts” box on the package label, or is recommended by the child’s health care provider. * If you DO NOT UNDERSTAND the instructions on the product, or how to use the dosing device (dropper, dosing cup or dosing spoon), DO NOT USE the medicine. Consult your healthcare provider if you have questions or are confused. * Cough and cold medicines only treat the symptoms of the common cold such as runny nose, congestion, fever, aches, and irritability. They do not cure the common cold. Children get better with time. * If a child’s condition worsens or does not improve, stop using the product and immediately take the child to a health care provider for evaluation.